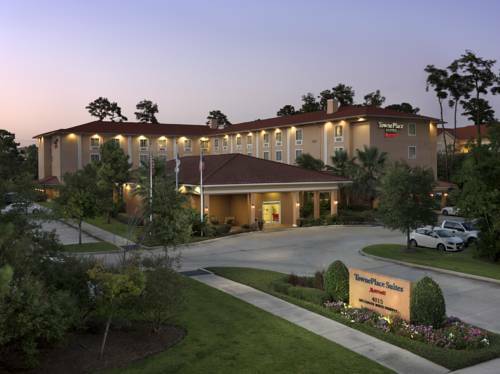 TownePlace Suites Houston Intercontinental Airport is located a few minutes from IAH Airport, yet nestled in a preserved tranquil setting secluded from the hustle and bustle of the city. Arriving to or departing from IAH airport? Our pet friendly hotel near Houston airport offers a complimentary shuttle that will pick you up and bring you back for your convenience. Our spacious Houston hotel rooms offer separate living and sleeping areas, fully equipped kitchens, 32 inch flat screen TVs, which is perfect for any short or extended stay in Houston, TX. If you're here on business, we're conveniently located near many local offices, including Halliburton, GE, Insperity, Cummins, Aggreko, Baker Hughes, Schlumberger, Siemens, and USPS. If you're here to explore Houston, TX, we're a few minutes from the best Houston attractions. Start your day on the right foot at our IAH hotel and enjoy our free full hot breakfast buffet. At the end of your day, relax poolside or partake in some barbecuing in our grilling pavilion.